It was a perfect fall day with lots of sunshine, food and prizes. 85 golfers and many volunteers were present to help make this a special day. The event raised several thousand dollars for the scolarship fund and was capped off with a HOLE-IN-ONE by Tammi Tetu from Traverse City. GOOD TIME were had at the 2nd Annual Ryan Woodward Memorial Disc Golf Outing Held July 23, 2011 at Grand Woods Park in Delta Twp. 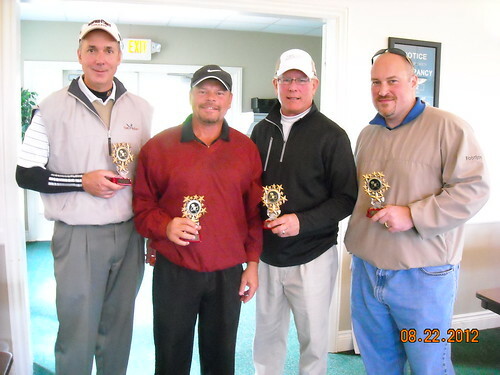 Awards were given for 1st & 2nd place, longest drive and closest to pin. Also raffle/door prices. Other activities included Ladder Ball, Bean Bag Toss, throwing the football and of course EATING. WE WON - - - - the Snap Fitness Charity Challenge with by for the most votes - thanks everyone for your help. Amount of winnings not yet determined. Golfers warming up before tee-off time. Click here to see more photos of the golf outing. Hole Sponsors: Scott Stevenson, DDS; Dr. Hatch, Mid-Michigan Dermatology, Alan Deming, Mackinaw Watercraft, Brian Songer Agency, Farm Bureau Insurance, James Mauro, Dickenson Wright, Amy Trahey, Great Lakes Engineering Group, Rehmann Healthcare Management Advisors, Dr. Burkhardt and Dr. Pecora, Orthodontic Specialists of Mid-Michigan, John Cosgrove, The Faucet Shop, Mike Franco and Chris Goodman, Pure Green Lawn and Tree Professionals, Dan Schooley, GIC Investment Club, Don Roe, Willow Wood Golf Club, Al and Trish McElrath. Prize Contributors: Hawk Hollow Golf Course, Eagle Eye Golf Course, R Club of Lansing, Lexington Lansing Hotel, Golf Haus, Red Robin Restaurant, Cuginos Restaurant, MSU Baseball, Salon Vivesta, Prairie Creek Golf Course, Cancun Mexican Grill, Kroger Frandor, M&M Distributors, North Side Auto Zone, Royal Scott Golf Course, Tim Staudt, Lansing Lugnuts, Rehmann Traverse City Office (Sherry, Tammi, Tom, Jim, Richard), Rehmann Healthcare Management Advisors, Sam's Club, Rick Oliveras, Kurt Deck, Chuck Bye and Gary Borucki. Cash Donors: Michael & Renita Schroyer, Steve & Mary Kelly, Heidi Bolger, Ara & Melissa Parseghian, Dan & Danise McAnnelly and Sara Bannon of Lakeview Consultants. The 1st Annual Woody’s Memorial Disc Golf Outing was held at Grand Woods Park in Delta Township. It was one of the hottest days of the year and the refreshments were in high demand. Chuck Bye grilled over 150 hot dogs for gang of great friends and family while enjoying live music from local band of 3 musicians. Food, drink and snacks were donated by Chuck Bye of Bye Insurance, Steve Ketchem & Don Harkness of Coca Cola and Kurt Deck of Kellogg.